Baby’s vision development is very important and even affects their other senses. 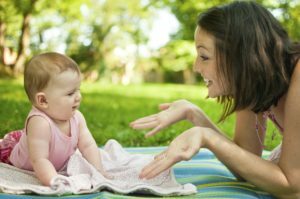 Throughout the first year, baby will be looking at you a ton, so be sure to look at them, give them a lot of attention, and make eye contact! Find out what you can expect in the coming months. Baby’s eyes can only focus on objects that are about 8 to 15 inches away – just far enough to see the face of the person holding them – and they typically begin holding eye contact around 1 month old.1 In the beginning, baby needs to be calm and alert to hold eye contact, so don’t try to check this milestone while your little one is hungry, distressed, or tired. It is normal for a baby’s eyes to wander or move randomly during the first couple months of life because they are learning how to use their eyes together. Baby will begin to focus on faces and close objects. Baby will also begin to follow moving objects with their eyes and may even reach out to swipe or touch the object as they develop their hand-eye coordination.1 By 4 months old baby will be able to see a full range of colors. Baby’s vision will be fully mature. During this time, baby will be able to follow faster movements with their eyes. Baby may also show more interest in toys with complex patterns and shapes. As baby grows they will become more comfortable using their vision to explore their surroundings. Point out and name objects as your baby sees them to help baby make the connection between objects and their names. If you have concerns about your child’s vision/eye sight talk to your child’s healthcare provider about scheduling an evaluation. There are many different types of eye doctors so make sure you are choosing the right one for your child. Vision is part of a baby’s development just like sensory, motor and communication skills, and it is important to keep track of these milestones during their first year. Shelov S. Your Baby’s First Year. Bantam Books: New York; 2010. P 196-612. Find great tips on how to make story time fun and interactive. Next Next post: What is Baby-Wearing?